Should we have open or closed borders? Should we build walls or bridges? Today on the program is CEO and co-founder of Munchery, Tri Tran, who fought his way into the U.S. from Vietnam and built a company that employs hundreds of people and that is changing the way we think about food. Especially in this time of heated debate around immigration, Tri’s story reminds us to look at the details of how we want to run our country — which in a way is like running a company — and ask: do we let the greatest entrepreneurs in, or force them to go elsewhere? Tri walks us through how Munchery redefines dinner — early inspirations, scaling his business, brand design, delivery efficiency, and more. 02:10-09:26: Jason introduces his guest, Tri Tran, CEO and co-founder of Munchery. Tri shares about immigrating from Vietnam at the age of 11 and the struggles along the way. 09:27-11:45: Jason asks Tri about his views on America in 2016. 14:56-18:40: Tri talks about the importance of education and his feelings of studying at MIT. 21:00-23:12: Jason asks Tri about the reunion with his parents and their impression of America. 23:13-24:49: Background of Munchery – Tri had to learn how to cook because his wife didn’t know how to. 27:59-29:27: Tri thinks back on his college years, when he was inspired by a professor that shared a lot of personal stories of overcoming adversities. 30:15-33:21: Tri talks about his neighbor that was a personal cook, who inspired him to think: How can I bring that to people? 33:22-37:14: Jason asks Tri if this a venture business, and whether it is an asset to approach this with fresh eyes? 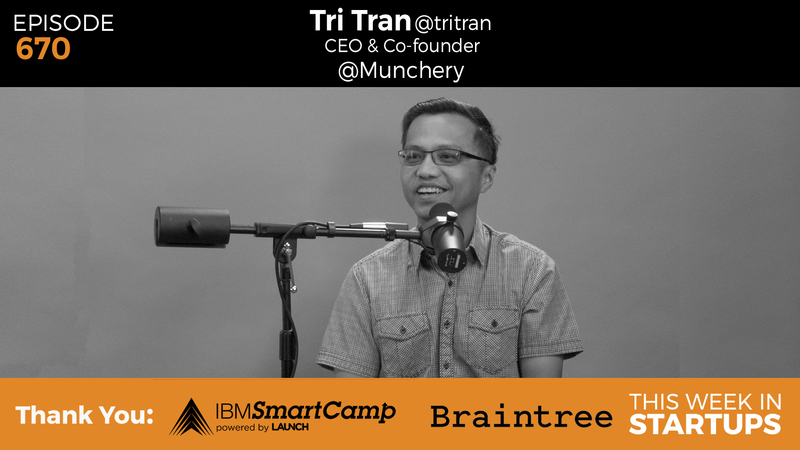 37:14-38:19: Tri explains how Munchery is changing the way people eat. 38:20-40:02: Tri explains the inspiration for the packaging for design for Munchery. 40:03-42:08: Tri breaks down the cost of Munchery entrees. 47:11-49:11: The two watch a Munchery product video, and then Tri talks about how the meal kits are dinners that you can put together in 15 mins flat. 50:29-51:33: Jason asks how running this business has changed, which leads to a conversation about important factors since play together to make a biz–KPI, NPS, etc. 52:18-54:30: Tri walks us through the growth of Munchery, and how as they scaled up, it was important to get a handle on unit cost (what goes into a meal). 54:31-55:49: Shares another video that shows the fresh design of Munchery. 55:49-58:37: Tri raises two questions around the idea of going public as a company, and the two discuss how the delivery market looks overseas. 01:00-01:04: Tri imparts his advice on building a company, and Jason shares closing thoughts around the entrepreneurial issues in a global market.